SCE Ticker / Scrolling Text allows you to bring any text message to your LEDs. ▪ BPM - Defines the speed [when using a direction/movement]. The default value is 600. Valid values range from 0 to 9999. ▪ Position - Defines the position of the text in X, Y, and Z [in %]. The default values are 0, 0, 0. Valid values range from -1000 to 1000. ▪ Extrusion - Adds depth to the text [in % of the Matrix Size]. This is mainly relevant for 3D. The default value is 100. Valid values range from 0.01 to 100. ▪ Text - Allows you to enter any text. Simply write something via your keyboard. The default text is MADRIX. Rotation - Allows you to rotate the text [0°, 90°, 180°, 270°]. The default value is 0. Tile - Allows you to tile and duplicate the text and thereby generating patterns. Seamless - Activates or deactivates a continuous stream of text. 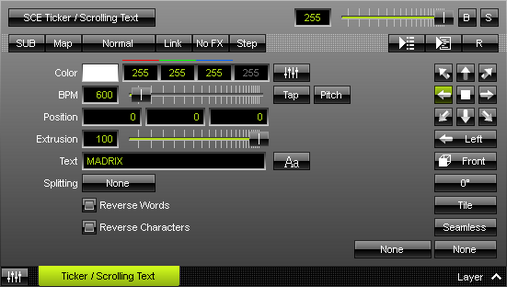 MADRIX will automatically display the text again, when the main text has ended. Otherwise, MADRIX will display the complete text first, before displaying it again. Stretching / Aspect Ratio - Allows you to choose the aspect ratio of the text. The default value is None. Matrix - Stretches to the current aspect ratio of the virtual LED matrix. Original - Stretches to the original aspect ratio of the source. 4:3 - Applies a 4:3 aspect ratio. 16:9 - Applies a 16:9 aspect ratio. Depending on your LEDs, the pixel pitch, and other factors, you might have the impression that text is not moving as fluently and smoothly as it should. Follow these steps to create a better perceived image quality. ▪ and the wider and larger the text is. 1] Choose a BPM value that makes the SCE Ticker Effect look good. Some recommended speeds are: 300 BPM, 350 BPM, 600 BPM, 750 BPM, 1500 BPM, and 3000 BPM. 2] Choose a font that is bold. Please avoid fine fonts or italics. 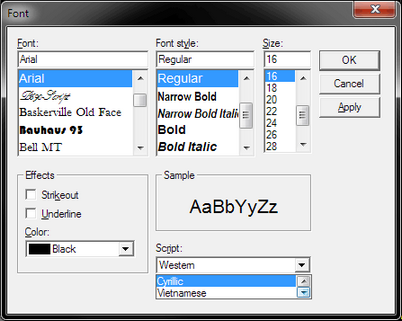 3] Try to choose a font that automatically has Anti-Aliasing applied to it. Not every font family automatically supports Anti-Aliasing. 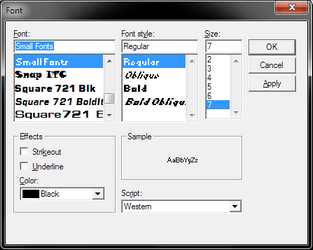 Anti-Aliasing reduces hard edges and makes the font smoother. 4] Reduce the overall tonal contrast of the Effect and image output. For example, white text on black background creates one of the highest contrasts. The higher the contrast, the more the text seems to be flickering.